Yellow Deodorant Stains on our clothes is a very common clothes care problem! Now more than ever we all regularly use anti-perspirants which inevitably over time will give a discoloured appearance to the underarm area of tops. How many times have you thrown out an item such as a shirt because the problem area of fabric seemed stiffer than other areas and had a yellow patch making it seemingly un-usable ever again? One product called Deo Go will put an end to this cycle of wasted tops! Until Deo Go no stain removers had ever tackled such difficult antiperspirant or deodorant stains. Follow instructions for this effective deodorant stain remover, to spray onto the hardened and yellow area of the armpit, brush and and leave to work for about 10 to 30 minutes, depending on the stain. Once it’s done it’s job wash it on it’s normal washing cycle and admire! The brushing simply speeds up the time it takes to work – make sure you use a short bristled brush and gently brush. Once it has had time to dissolve the deodorant residue put it on the garment’s regular wash cycle following the washing instructions. A little time may save you a lot of money!how to remove yellow armpit stains. 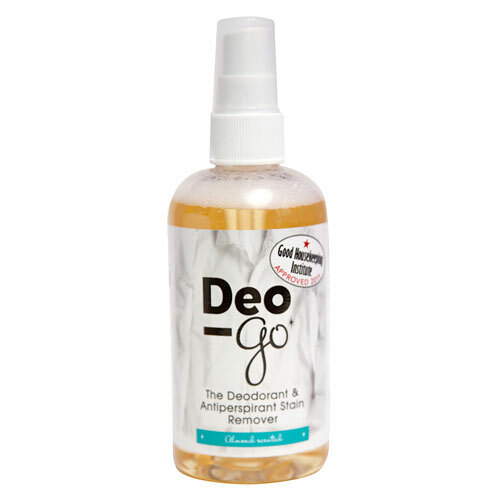 Deo Go was recently mentioned in Good Housekeeping and one of the 2011 Approved Good Housekeeping Institute products, you know you can rely on Deo Go to effectively remove those unsightly yellow and hardened patches!